Portland, Oregon provides an ideal location for aspiring chefs. The progressive culinary landscape is, in many ways, on the cutting edge of food industry trends. Students at Le Cordon Bleu College of Culinary Arts- formerly the Western Culinary Institute- enjoy every aspect of the vibrant food culture within this thriving city. In 2007, the Food Network awarded Portland the distinguished title “Delicious Destination of the Year.” A haven for the arts, Portland is also home to many vegetarian restaurants and fresh food markets. Travel and Leisure ranked Portland among the top ten US cities for food and dining, in 2007. Le Cordon Bleu College of Culinary Arts, formerly known as the Western Culinary Institute, is located in the historic Galleria Building in downtown Portland, Oregon. The main Portland campus occupies 50,000 square feet within the Galleria Building. The space is filled with lecture halls, classrooms, and nine different kitchens. The library houses all forms of media, including computers and online portals, all focused on hospitality and fine dining. Two other computer labs are also available to all students. The building also houses two student-run restaurants: Bleu, and a less formal epicurean venue called Café’ Bleu. Both are conveniently located at street level. The culinary school has been in operation for more than two decades. In 1983, The Horst Mager Culinary Institute opened its doors in Portland, Oregon. Two Portland executives, Horst Mager and Donald Waldbauer, created the institute in response to an increasing demand for professional chefs. The school gained a stellar reputation for active, hands-on training and its quality curriculum. Students from all over the United States began enrolling in the program. The school changed its name to the Western Culinary Institute in 1986. This new name reflected its location, as well as its national standing. Western Culinary Institute joined a nationwide network of career schools ten years later, opening new doors for its graduates. Within a few years, the coveted Le Cordon Bleu Diplome’ was added to the Associate’s Degree credential, for all graduates. This association with Le Cordon Bleu added prestige to Western culinary Institute’s already stellar reputation. Since 1999, the school has been known as Le Cordon Bleu College of Culinary Arts in Portland. Le Cordon Bleu has a reputation as one of the oldest and finest international culinary institutions. Collaboration with supportive professionals allows students to experiment with new ideas and techniques. The school provides quality curriculum, active involvement, on-the-job training, and career support for all its students. 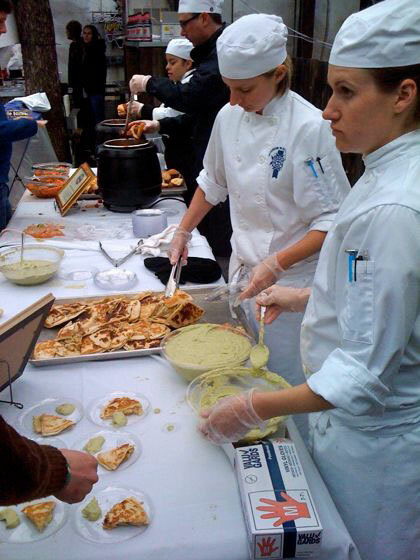 Le Cordon Bleu College of Culinary Arts in Portland offers four on-campus programs. An online program is also available, and is administered by the central organizational body of Le Cordon Bleu College of Culinary Arts. A 101-credit program, which can be completed in either an accelerated 15-month course of study, or over a 21-month time frame, leads to a Le Cordon Bleu Degree. Students take 25 general education credits in communication, writing, composition, math, and psychology. The 76 core Culinary Arts course credits include varied cuisine classes, externships, and restaurant rotations. A 98-credit program, which can be completed in either a 15-month time frame or over the course of 21 months, earns each graduate a prestigious baking and pastry credential. Students complete 25 general education credits in communication, writing, composition, math, and psychology. The 73 core course credits include hospitality, baking, confectionery, and patisserie training. Successful completion of the program requires a cumulative 2.0 GPA and a completed externship. A 39-credit program, which is completed in 9 months, takes students through core courses in hospitality, baking, confectionery, and patisserie. Successful completion of the program requires a cumulative 2.0 GPA and a completed externship. This online program is for students who have already earned an Associate’s or equivalent degree. A wide range of advanced topics build on previous professional experience and training. This program is offered through the main Le Cordon Bleu College of Culinary Arts. Contact an admissions representative for the most up to date information.